If you hike, bike, garden, play outdoors with pets or kids, this event is for you! 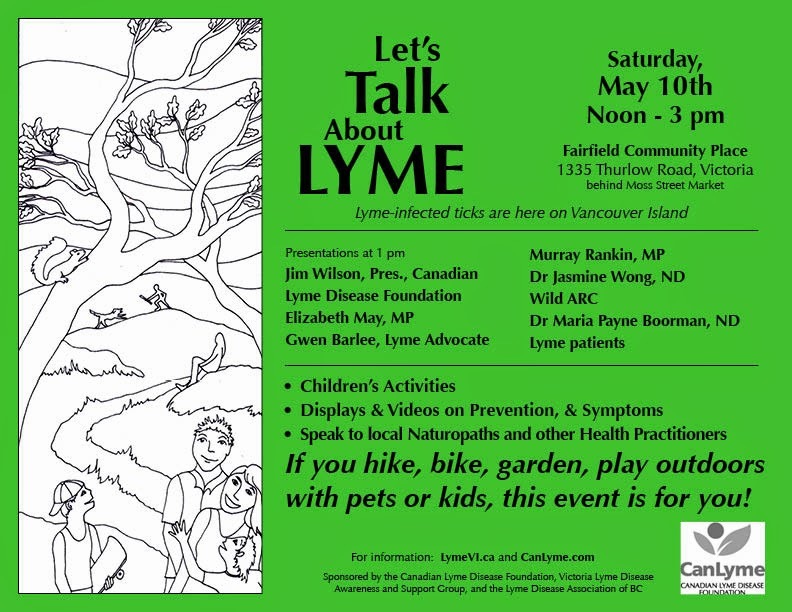 I’m really pumped to invite you all to our local Lyme Disease Awareness month event: Let’s Talk About Lyme. If you call Victoria, BC, Canada home, or are close by or visiting we would love to share an afternoon of uplifting stories, hope and awareness. This is the event I wish I’d gone to before I got sick! We have some amazing speakers lined up (The MP’s Elizabeth May & Murray Rankin, and Jim Wilson of CanLyme will be there! And some seriously cool activists – like Gwen Barlee…and Lyme disease patients. I will be speaking as well!). Invite your friends, family and neighbours and local groups. Check out our Facebook Event, and share and invite to your heart’s content! Want to help out? We’re looking for volunteers to help set up & take-down, and help with kids craft (we’re making modelling clay ticks! and doing a faux-tick drag for kids…and there is a colouring table…just saying…it’ll be a blast.). If you’d like to help out, please email me for more information @ bitemeback@live.com. feel free to share the poster with friends, family, neighbours, co-workers…everyone. let’s stay safe this tick season. Lyme-infected ticks are here on Vancouver Island! Join us for an afternoon awareness & prevention event featuring awesome children’s activities, amazing guest speakers, prevention and awareness booths and videos, and speak with local health care practitioners. See you on on the 10th of May!